The European Space Agency has selected a satellite to fly scorchingly close to the sun and a probe to map the structure of the universe for launch in 2017 and 2019. In a fight for scarce funding, the selected missions beat out a planet-hunting mission designed to find Earth-sized planets in the deep cosmos. The winning projects picked Oct. 4 by ESA's science program committee are named Solar Orbiter and Euclid. "With the selection of Solar Orbiter and Euclid, the science program has once more shown its relevance to pure science and to the concerns of citizens: Euclid will shed light on the nature of one of the most fundamental forces of the Universe, while Solar Orbiter will help scientists to understand processes, such as coronal mass ejections, that affect Earth's citizens by disrupting, for example, radio communication and power transmission," said Alvaro Gimenez, ESA's director of science and robotic exploration. Cost and scientific value were the major factors in the decision. Each mission is expected to cost ESA between $670 million and $800 million, not including significant funding from international partners. The Solar Orbiter probe will pass closer to the sun than any previous mission, approaching 26 million miles from the sun's fiery surface to sample the solar wind shortly after it is ejected. The spacecraft will also include remote sensing imaging instruments to observe the sun's corona and the solar atmosphere. Scientists hope Solar Orbiter will unravel how the sun influences the solar system by determining the origins and causes of the supersonic solar wind, the sun's magnetic field, and massive eruptions from disturbances on the sun's surface. It will launch in January 2017 aboard an Atlas 5 rocket from Cape Canaveral, Fla. NASA's primary contribution to the European-led Solar Orbiter is the launch vehicle and one of the instruments in the probe's scientific suite. Solar Orbiter would reach its closest point to the sun about three-and-a-half years after liftoff, or some time in 2020 assuming a launch in January 2017. Subsequent flybys of Venus will gradually alter Solar Orbiter's trajectory to move closer to the sun's poles over the ensuing few years, according to ESA. 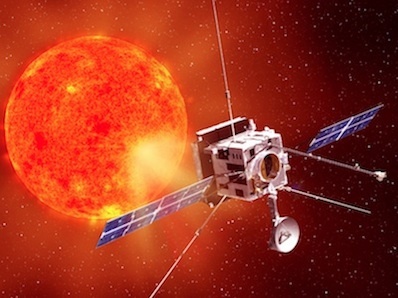 The Solar Orbiter mission has been considered by ESA for more than a decade. Euclid will depart Earth on a Soyuz rocket launched from French Guiana in 2019 and head for the L2 Lagrange point, a gravity-neutral location where the pull from the Earth and sun allow for a stable observing point of the cosmos. 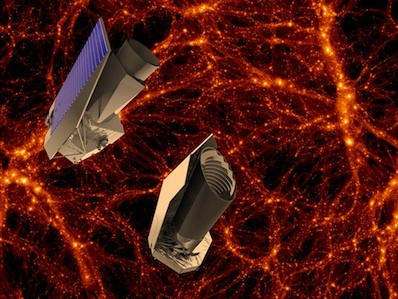 With a 3.9-foot telescope, the Euclid mission will investigate the nature of dark energy and dark matter by measuring the accelerated expansion of the universe. Three-fourths of the universe is made up of dark energy, a mysterious force causing the universe's expansion to accelerate. Astrophysicists believe another 20 percent of the universe is composed of dark matter, which exerts the same gravitational force as normal matter but does not emit or absorb light. Euclid's instruments will chart the three-dimensional structure of the universe through the last 10 billion years, tracing its expansion and the effects of dark energy on its evolution. Solar Orbiter and Euclid were picked over Plato, a proposed mission to gauge the frequency of planets around other stars, including planets in the habitable zone, where conditions could be suitable for life. ESA selected Solar Orbiter, Euclid and Plato in 2010 as finalists for the agency's next two medium-class space science missions. The projects are part of ESA's Cosmic Vision program, which aims to plan for scientific probes launching between 2015 and 2025. "It was an arduous dilemma for the science program committee to choose two from the three excellent candidates," said Fabio Favata, head of the ESA science program's planning office. "All of them would produce world-class science and would put Europe at the forefront in the respective fields. Their quality goes to show the creativity and resources of the European scientific community." Plato will rejoin other candidates in the next round of selections. ESA had planned to choose a larger flagship-class mission for implementation this year, but international partnerships with NASA evaporated after the U.S. National Research Council did not name any of the finalists as NASA's top space science priority. With the likelihood of NASA contributions reduced, ESA delayed the selection of a large-class science mission to evaluate how Europe could take on a larger share of the costs without the help of the United States.